Has this happened to you? You look forward to an important presentation – only to find yourself struggling through a series of poor quality projected images? Perhaps under dimmed lights, with drawn shades? Under these conditions, it’s difficult to read text and make out images. Concentration tends to wane – not only spoiling your focus, but also your understanding of the subject. What’s more, you may have suffered with tired, irritable eyes – which is the unfortunate consequence of what’s known as the “rainbow effect”. Read on for details of this effect. This problem is inherent in 1-chip DLP projectors and, with prolonged viewing, might also cause headaches. 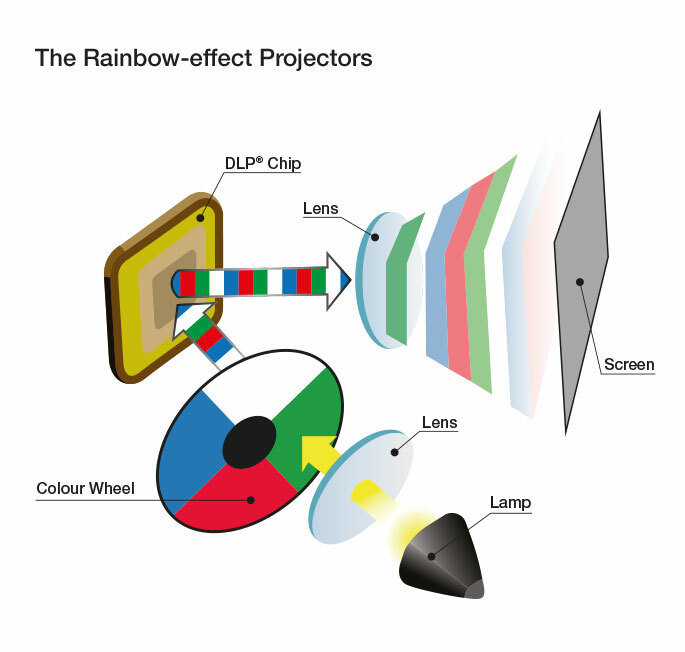 A 1-chip DLP projector relies on a single micro display chip and a spinning colour wheel. At any given instant, the system displays either red, green or blue. Shown rapidly, our brain combines these individual colours into one image. However, viewers may see flashes of individual colours – the rainbow effect – particularly across dark areas or fast action in a video. With a 3LCD projector, white light is first split into red, green and blue beams. Each beam is then filtered through its own individual LCD, which gives images the exact brightness for each colour. The colour beams are then perfectly recombined in a prism before being projected as a complete image. No spinning wheel. No rainbow effect. Just a comfortable viewing experience. A wider range of colours for a more lifelike display. The range of colours displayed by a projector is called a “colour gamut”. The wider it is, the better the images. 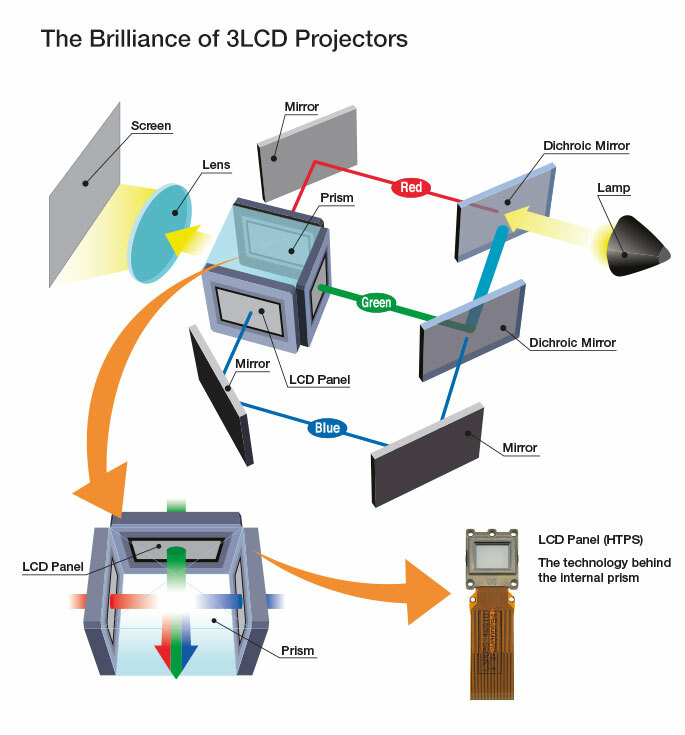 3LCD projectors have a colour gamut 3 times wider than 1-chip DLP projectors. 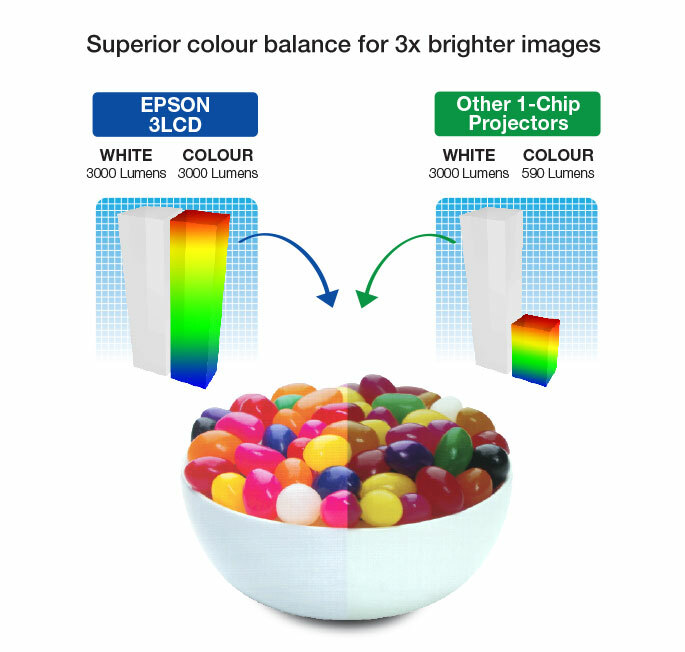 Superior colour balance for 3x brighter images. The specifications of 1-chip DLP projector may only reflect its white light output. Even if a projector has high white brightness, it may have low colour brightness where your images would turn out dull and dark. 3LCD projectors have equal colour and white output levels; ensuring faithful images with superior colour balance. The high colour brightness of a 3LCD projector delivers images with vibrant and realistic hues – and there’s no need to dim the room. So, be it at work, in classroom or at home, users can have better experience when viewing with 3LCD projectors. All of these benefits add up to projections that are exceedingly vibrant, clear and realistic. However, with customer budget restraints and confusion about what’s available in the marketplace, the tendency is to go for cheaper 1-chip DLP projectors. A demonstration of a 3LCD projector will quickly highlight its advantages. In an independent study conducted by Radius Research in the U.S, the high colour brightness advantages of 3LCD projectors were overwhelming. When tested against 1-chip DLP projectors, 9 out of 10 people preferred the images achieved with Epson 3LCD technology. So, why compromise your vision, when you can enjoy bright, realistic images in all your projected presentations. Do away with 1-chip projectors and wow your audiences with a new level of projected excellence. 1Data from Futuresource Quarterly Market Insight Reports. Sell-in volumes, representing at least 95% of the worldwide market, are collected from manufacturers each quarter. Data is cross-checked with inputs from distribution channels and component suppliers. This data collection methodology enables Futuresource to accurately size the Projectors Market and provide detailed brand, specification and application shares in over 66 countries worldwide. Now all your projector presentations can be packed with bright, clear, powerful images, and smooth, rainbow effect-free videos. Thanks to Epson 3LCD Projectors, you can always be sure your presentations are outstanding and your audiences are captivated. Epson 3LCD projectors project three times wider gamut that matches closely to the original standard of a display device (sRGB), as compared to 1-chip DLP projectors. 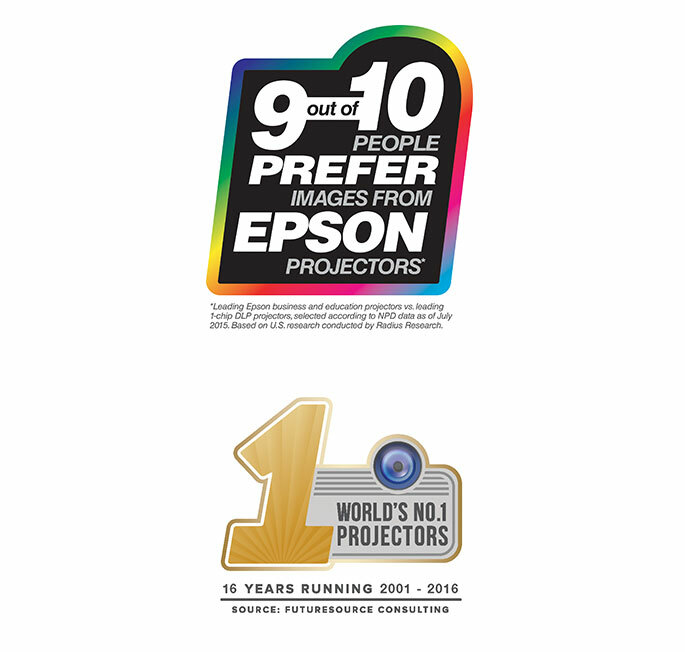 Epson 3LCD projectors deliver up to three times the colour brightness, effortlessly creating the same colour and white brightness, resulting in faithful images and superior colour balance. The rainbow effect may cause users to suffer headaches with prolonged viewing. Epson projectors do not give out this effect, so users enjoy a comfortable experience. To find out more about Epson 3LCD Projectors, click here.